And I thought, "oh! this is so cute! I want to go to this place too!!" And of course, that person was only the friend of my friend's friend. 4th degree of separation, and I wasn't gonna be a creep and randomly ask that 4th degreed facebook person to tell me where that place was. So, I did some google search, and basically typed in "Where can I get the Buddha Belly drink in Minneapolis?" and somehow Jasmine 26 came up. Also, the Saigon Mojito: pineapple rum and melon liqueur with fresh mint, and the Ginger Frizz: ginger infused vodka with spicy sweet ginger ale. Very delicious. I always love fun cocktails. Entrees: I was really having a hard time choosing between the noodle salads and the specialty dishes... I always like the Vietnamese noodle salads, so refreshing. I especially like the sweet and sour sauce, those you pour over the vermicelli noodle, and the marinated shrimp... yummm! A mix of sweet, tangy and grilled flavors. Grilled Shrimp Coconut Milk Noodle Salad: Grilled shrimp tossed in coconut milk with thick "udon-style" noodles, garnished with shredded lettuce, cucumber, herbs, cilantro, and a sprinkle of roasted peanuts. Served with house vinaigrette sauce. But instead of the noodle salad, I picked the specialty dishes instead. Jasmine Crepe: Crispy turmeric rice crepe, filled with stir fried pork and shrimp, bean sprouts, onion and yellow mung beans. Very very delicious. The turmeric rice crepe is very awesome! Not too turmeric-ky, but enough to bring in some kick to the pork and shrimp light stir fried. I especially love the bean sprouts. The whole thing kind of tasted like Egg Fu Yong, but, well, much better version of that. Caramelized Lemon Grass Shrimp: Sauteed fresh garlic, onion, lemongrass and shrimp glazed in a rich caramelized sauce. This very much reminds of me the sweet mayo shrimp dish I always love and order in the Chinese restaurants. But it's not the mayo, it's the sweet flavor and the thin layer of crisp that I like. Similarly, this dish is very flavorful. And that's definitely a lot of shrimp for $15! Just that they charge you $2 for extra rice... What a deal?! Overall a pretty decent place for a small and cute dinner. Love the cocktail menu, and the setting is really nice and quite. There was quite a crowd on a Wednesday night, and the restaurant was about 70% full. Service was decent, and the server kept asking us if we wanted more cocktails. Hahaha, very smart... But I'm smarter! I have to drive, and I'll always drink responsibly. And no, I still haven't found that Buddha's Belly vase restaurant. And I'm still not brave enough to break that 4 degrees of separation and start asking that friend of a friend of a friend. 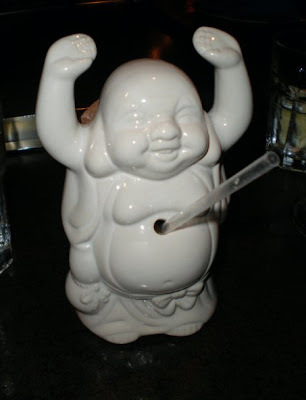 So, please, if any of you guys out there know where they serve that cute little Buddha's Belly, let me know!! !